It’s been 50 years since the Summer of Love hit San Francisco and there are still days when, near Golden Gate Park, you might think it was still going on. We know that the San Francisco Recreation and Park Department keeps turning down the permit for a big Summer of Love party in Golden Gate Park (boo! ), but guess what? 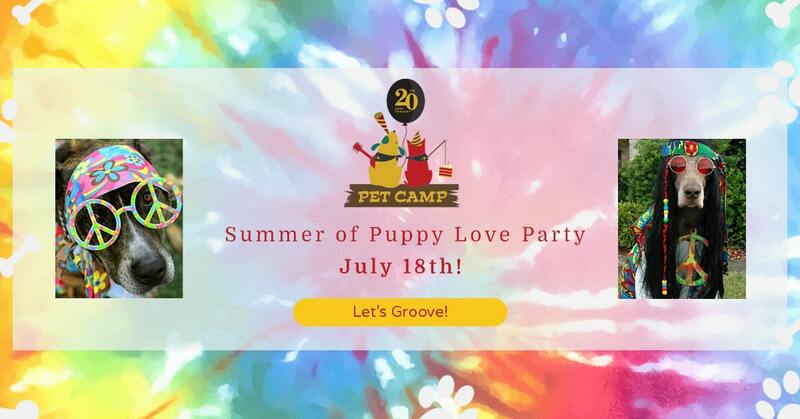 We don’t need no stinkin’ permit to have a Summer of Love party at Pet Camp! Join us on July 18th for our Summer of Puppy Love party. Every Back Country dog will be included! There’ll be tie dye, folk songs, but no free doggie lovin’ (come on – what were you thinking?) and yes, this is still a free event for our overnight and day campers!